When walking toward an ultrasonic sonar, a person generates a Doppler signature in the same way that a car does when it moves toward a traffic enforcement radar. Because we each swing our arms, legs, and torso in a unique way as we walk, micro-Doppler sonar data can be used for human recognition and detection. 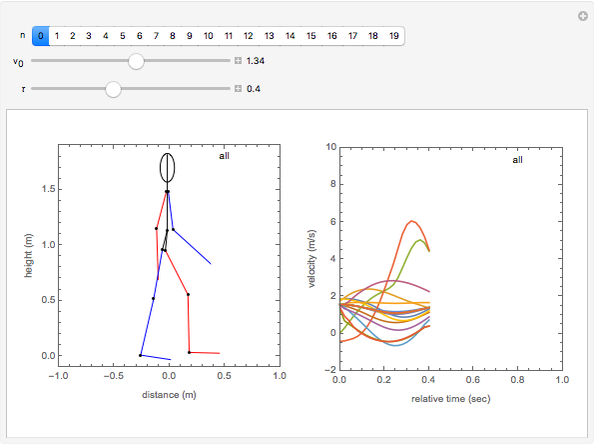 This Demonstration simulates the response of a micro-Doppler sonar to the motion of 19 key body parts as a person walks toward the sonar. The human motion portion of the simulation is based on . Use the setter bar in the Demonstration to select the body part for which velocity is calculated. In the left-hand graph the selected body part will be highlighted in yellow. The right leg and arm are shown in red. The left leg and arm are shown in blue. The velocity of the body part is shown in the right-hand graph. Choosing results in the selection of all 19 body parts for the velocity computation. 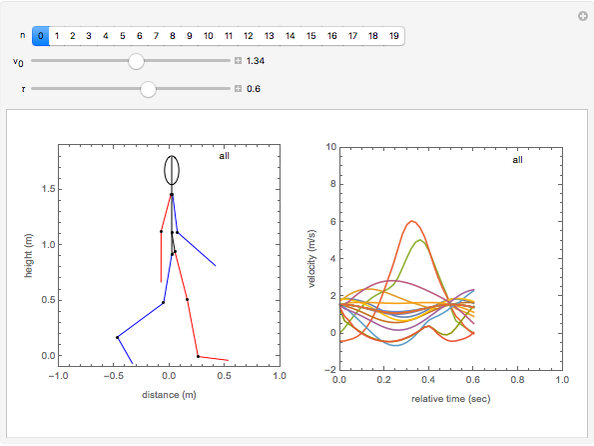 The lower two buttons control the velocity (m/s) of the walker and the relative time (sec) in the walk cycle. As varies from 0 to 1, the individual takes two steps. By varying the individual can be made to "walk". The simulation assumes that the individual is six feet tall. 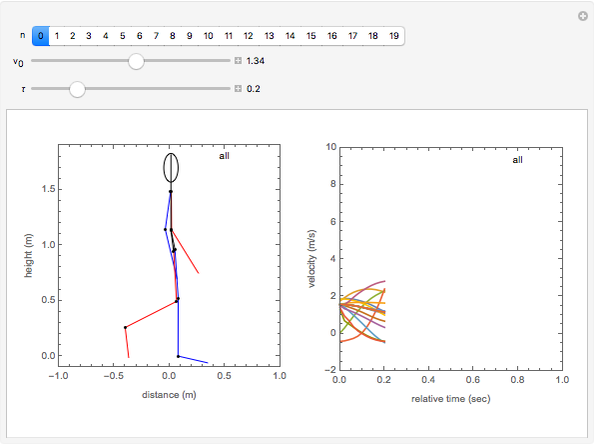 R. Boulic, N. Thalmann, and D. Thalmann, "A Global Human Walking Model with Real-Time Kinematic Personification," Visual Computer 6(6), 1990, pp. 344–358. M. Bradley, "A Mathematical Implementation of 'A Global Human Walking Model with Real-Time Kinematic Personification' by Boulic, Thalmann and Thalmann," Human, Light Vehicle and Tunnel Detection Workshop, June 16–17, 2009. Marshall Bradley "Micro-Doppler Sonar Simulation"